One of the important thoughts that we took away from iPres2016 is that we are not alone in trying to implement a digital preservation programme at Oxford and Cambridge: we are part of a helpful, collaborative digital preservation community. We were also struck by the variety of backgrounds conference attendees had that brought them to the digital preservation field. What background and experience do you bring to the project? What particular skills, knowledge and attributes do you bring project? I have worked in IT systems design and development for 20 years, recently graduating with a PhD in Information Science. I have worked with museums and archives on digitisation projects. I have knowledge of Information Retrieval that is applicable to the discovery aspects of digital preservation, but I have plenty of expertise of working with data more generally, too. I come from a background in the Social Sciences and Archives, which has given me experience in collecting and interpreting evidence. This was the path which brought me into Digital Preservation, as I enjoy constantly learning, problem-solving and of course lovely big chunks of data. I have a professional background in records management, archives and UK information compliance with over a decade of experience. I enjoy explaining ideas and systems to people, demystifying seemingly abstract concepts to help people develop their own skills and interests. I bring to the field a strong background in photography, alternative processes and the management of photographic collections, physical and digital. Being in that field drew me to digital preservation; the question of “now what?” came up regularly when looking at managing born-digital and digitised photographs over time. I believe important attributes that I to bring to the field are an eagerness for life-long learning and a tenacity towards problem-solving. I’ve found that being willing to learn something new and tackle a problem logically (and with the help of Google or by asking people). Also, just “giving it a go” can go a long way when working in digital preservation. I have a background in the arts and music and have spent over 20 years working at the nexus between creativity and technology. I am a (somewhat lapsed) sound/media artist and have worked in a number of cultural institutions across the GLAM sector in Australia. I’ve worked in a production and tech capacity in Australia and Germany on festivals and events as well as live-to-air national radio broadcasts. This has given me considerable experience in problem-solving technical issues in short time-critical situations. Basically, I’m a jill-of-all trades, mistress of none and I learn something new every day. To draw these together, we made a word cloud to see if there were any common attributes. Word cloud from the Fellows’ thoughts. Courtesy of wordle.net. To address digital preservation in a sustainable way within our respective institutions, it would seem that a team that has the collective ability to enjoy solving problems, interacting with people as well as having varying, yet complementary, professional backgrounds and experience is a great starting point. We realise that in many organisations, assembling a team may not be practical nor have the resources available and we know that this project is very lucky in this regard. However, if you can problem-solve, interact with people in your organisations and the wider digital preservation community (they are very helpful!) you are well equipped to at least begin tackling your digital preservation challenges. 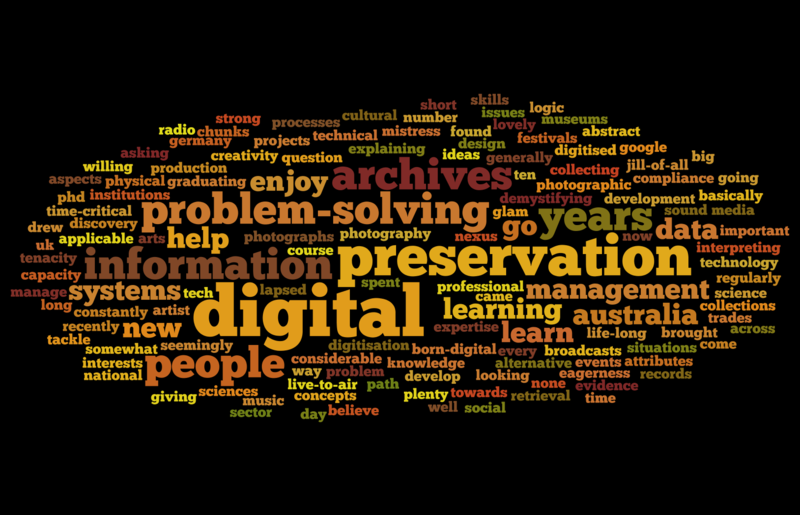 This entry was posted in collaboration, digital preservation, skills & competencies, training by ljp. Bookmark the permalink.